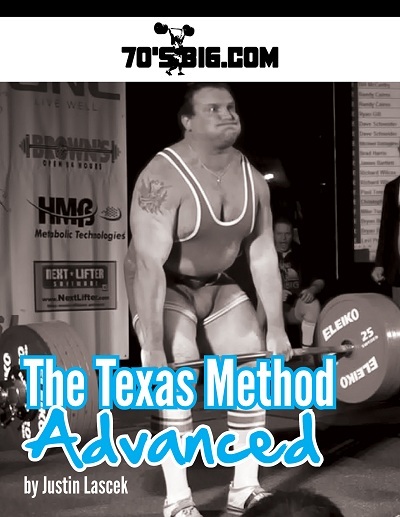 The Texas Method: Advanced teaches you how to control dosages of volume, how to structure the program for use in raw powerlifting, and a variety of important programmatic tweaks like “Intensity Day Rotations” and a new template that will push you past your sticking points. There’s 90 pages of information, and most of it can be pulled and used in almost any program. 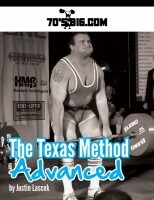 This is the most proven and effective programming tool 70’s Big has created to date. And did I mention that the forward is written by Brent Kim? Now you know it’s good. 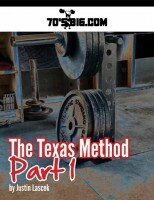 The Texas Method: Part 1 is now available at a reduced cost with a new cover! This entry was posted in Books, Content by Justin. Bookmark the permalink. For us who already have the first e-book, is there a way to get the new cover only? At a bigger resolution than the one in the post. A quick scan shows this another great book stuffed with useful information. There’s a lot to learn here, thanks Justin. I’m looking forward to this. Any plans to publish these in hard copy? Agree. I would also like this in hard copy. Maybe even one of those plastic ring bound books. I guess I could take them both to kinko’s or something, but would rather have real book version. Been waiting a while for this; very excited to start reading. Thanks! I feel that it’ll provide a lot of helpful information. ditto…any option of hardcover/binded version? I just printed (both of) mine out, hole-punched it and put it in a simple plastic binder. The prophecy has been revealed. 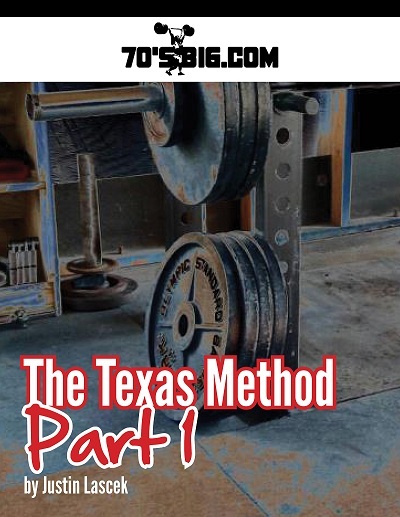 Justin, have you ever tried alternating heavy and medium work for the squat and deadlift every week? Or is alternating heavy work with speed sets the better option? Doing medium work isn’t much of a stressor; that’s what the “volume squat day” becomes (a medium session). It wouldn’t be a crappy set up, but I like speed work. Sweet. I already have part one printed in a binder, welcome home part two. Bought both part 1 and 2 together. Going to read them in order, thanks! Once I get through them I need to get around to reading FIT. Congratulations on the win, Chris! Chris’s blog link should be retitled ‘The Champ’. Haha this would happen days after I buy Part 1. Good read, useful info in the first. Yo, this book is awesome. Another book that needs to be read multiple times to really grasp everything.